The 17th Street sinkhole has been complicating downtown travel since it dropped in last week — back before the partial government shutdown ended. Now, it's serving as yet another obstacle for federal workers who just want to get back to work. 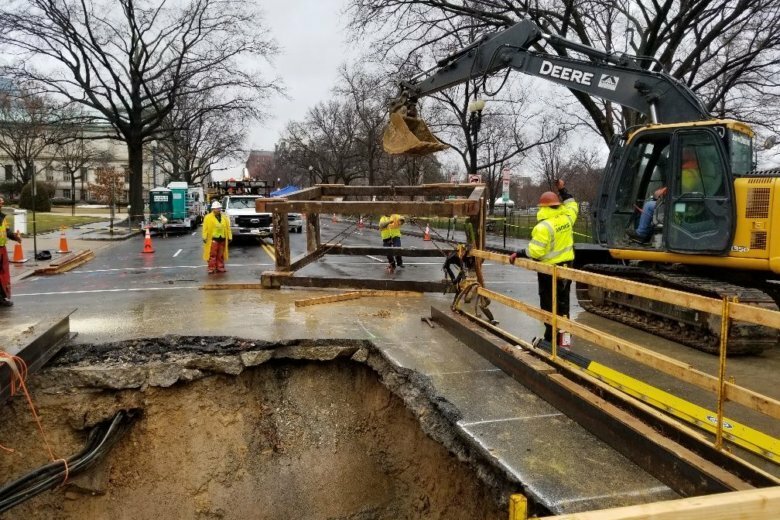 WASHINGTON — The 17th Street sinkhole has been complicating downtown travel since it dropped in last week — back before the partial government shutdown ended. “Even when it happened during the shutdown, it caused massive backups,” said WTOP Traffic Reporter Mary DePompa. And on Monday, it served as yet another obstacle for federal workers who just wanted to get back to work: 17th Street Northwest remains closed between C and E streets Northwest, and D Street is closed between 17th and 18th streets. At10 a.m. Monday, DePompa said the ripple effect from the work site was impacting feeder routes from north of D and even in from Virginia. Southbound 17th is diverting at New York Avenue. Northbound traffic is being diverted at C.
Unfortunately, commuters will have to contend with the detours for the next few days. In a statement last week, D.C. Water said that a sewer line needs to be repaired after it was damaged by falling concrete. Those repairs are complicated by nearby power lines (which fortunately weren’t damaged). Once the sewer line is fixed later this week and power is restored through those lines, work on the sinkhole itself can begin.